gardening in the boroughs of nyc: Oh Compost, I can't wait to use you! When we moved into our house, our first housewarming present was this cool composter. It filled up pretty quickly so we had to get a garbage pail as a secondary composter. Next to the compost bins is our ugly garage that is falling apart. So embarrassing! Our neighbors hate our garage! We plan on rebuilding this garage next year, that is our "big project" for 2011. I'm not sure if we are doing this correctly. We try to balance the greens and browns, and keep things moist, but not sopping wet. This is what it looks like inside. Sometimes you can even see it "steaming". How long does hot compost usually take to fully compost? I'm hoping to use this black gold in the garden next year! We bought so much compost for the garden this year, that I don't want to spend another cent on compost ever again! It pains me everytime I have to buy... well dirt! I spent big bucks on a compostumbler, but I sure haven't got the hang of it. We have yet to harvest one load of compost! I don't know what I'm doing wrong. I'd better study up on it. Butterfly bush is a must have in my garden. Today alone there were four different kinds of butterflies and a hummingbird visiting it all at the same time. If you have steaming, that's good! I rely on smell, if it smells putrid, add more carbon matter (leaves, cardboard, etc) but if it smells just "earthy stink" you are doing great! I am a lazy composter, only turn a few times a year so I never get the steaming, but we still get compost. Sounds like you are doing great! Yay for compost! You asked about hydrangeas, and I put a comment up but in case you're busy: morning sun/afternoon shade with rich, moist but well-draining soil is best for hydrangeas. Mulch around base to help keep moisture in soil if it's hot and dry; hydrangeas are prone to wilting in hot afternoon sun especially if the soil is at all dry. It takes them a couple of years to get well established, but they're worth it for the later-summer colour they provide. Good luck! I use my compost mainly on my roses. Great surprise last year when I had tomato plants in my rose containers. Finally figured out it was from my compost. Tomato seeds will live through the composting process. Since I love volunteers, I left them where they grew and picked cherry tomatoes and roses at the same time. I've gotten pretty much broken down compost in a few weeks, but I baby it. Your picture looks like your compost is heavy on the carbon side (leaves). I'd maybe throw in more greens (grass clippings?) and turn it every other day. Since it's heating up, though, that's a good sign. Oh, yeah. Almost forgot. At a certain point you do have to stop adding greens and let it sit for a while so it can "finish," which is basically letting the carbon/browns finish breaking down the greens. I still turn mine, though, when it's finishing. I'm a lazy composter as well. I usually just throw the items in a designated pile, stir ever so often and by spring I am left with some good stuff to use. Good luck! 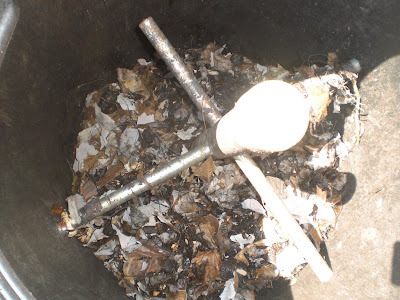 I want an actual composter someday. It is on my wish list. Your compost looks good. You're right to get a mix of dry and wet - we use shredded paper at times as we have a lot of wet. 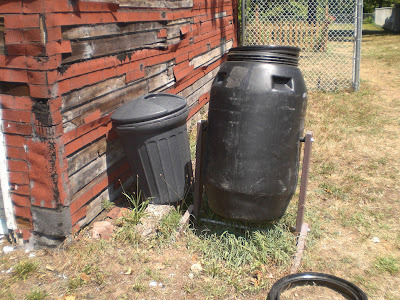 I always close down one compost bin once I empty the other one - usually in May, then it gets to sit until next spring while I fill up the other one, that should be long enough for you too. But beware, it will shrink and you'll have a lot less than you thought you would! If your compost pile is steaming, I think you're doing well! That's a lot better than my compost pile so far. I know what you mean about not wanting to spend any more money on compost. Composting is the next thing to get a handle on... I've come to realize the importance of it. Would love to get a tumble composter but will probably make a pallet one.